420 Artesian Lane, Tryon NC 28782. Contact Lynne Perlmutter 828-817-1800 lynne@aroundtryon.com or www.aroundtryon.com/10-acre-retreat-near-tiec-$325000/ Woodsy one level ranch with sunny wide open living/kitchen area. 3/2 w huge basement + workshops on magical 10 acre property in the middle of Tryon's old Equestrian Country. Rare winding spring fed stream + hundreds of hardwood trees. It's an awesome, living breathing outdoor indoor artists studio in the woods yet close to town. Anyone looking for a ranch home on acreage should consider the potential here. Gigantic walk out basement with finished artist studio, cellar...storage seems infinite. Attached oversized one car garage is fantastic workshop. More space upstairs in tall well insulated attic. Large free standing 2 zone woodshop pavillion w artisan stone fireplace. Flat and easy terrain with springs great for barn and pastures. Incredible dream property as-is or re-envisioned for outdoor lovers. 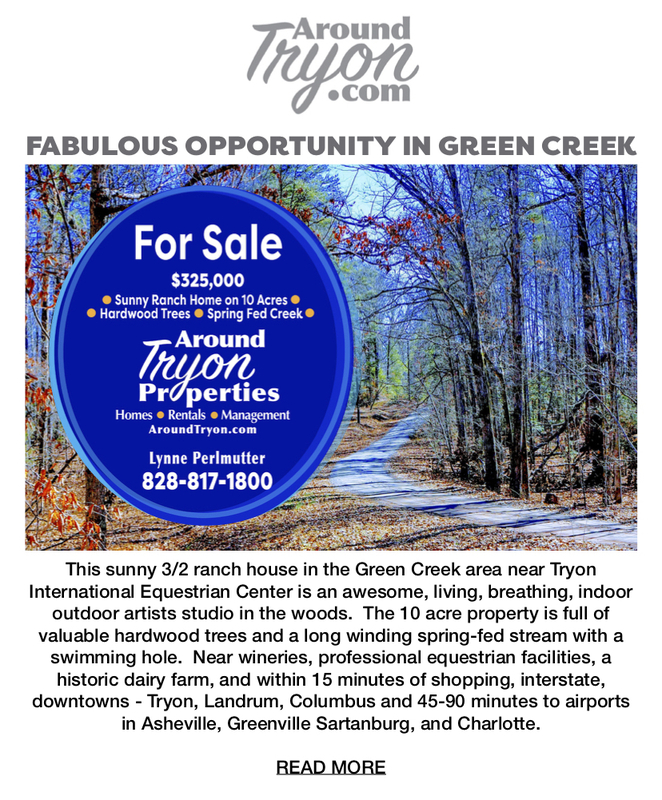 Fabulous bargain for a home ready to live in, investment, equestrian rental, long term income producing or second home only 8 miles from all the action at Tryon Int'l Equestrian Center. Agent Remarks:10 acre property in the middle of Tryon's old equestrian country. Approx 6 acres of the land,with winding spring fed stream and hundreds of hardwood trees have been hand surveyed. Incredible dream property as-is or re-envisioned for nature lovers or just a fabulous bargain in the equestrian area center hot zone. Home is ready to rent as-is for a few years as investment or second home near all the action at the equestrian center.